Innoz India’s fastest growing mobile and web expert company today announced the launch of mobile file sharing and networking application named as Tranz. 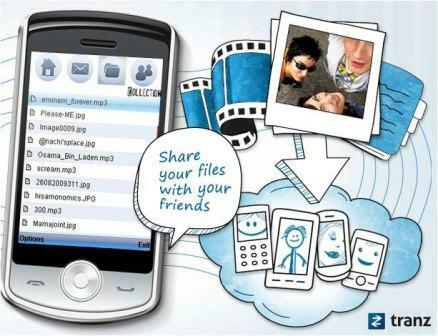 Using Tranz one can share any kind of files on mobile with your phone-book contacts. Tranz works with GPRS/3G, WIFI enabled mobile phones. Tranz currently supports all JAVA enabled handsets, Deepak Ravindran CEO Innoz India quoted Tranz will be soon available for Symbian,iPhone and in android platform.One can download the application from http://www.gotranz.com . Share your thoughts; get to know what’s latest with your friends and what’s latest on your friends’ phones. Private Send is a feature that allows you to privately share any file with your friend thus making Tranz a very personal tool. Your wish for a Bluetooth with an amazing range has finally come true.Time to go Tranzing! The best thing about Tranz is that it lets you share files with a very closed network — friends on your phonebook. No spam from unwanted people, complete privacy and security for you. Tranz only lets you share with people you actually care! Some files always are the talking point among your friends.This feature helps you to let your friends know which file is driving you crazy by adding your thoughts and shouting about the file. As the name suggests this feature lets you send direct messages to your friends. Built in such a way that it is simple to write and send to one or more friends like an email and very easy to view and reply like an sms. View the friend suggestions for Tranz users who are not on your phonebook. Lets you update your Tranz friends by syncing your phonebook. Set download location of your choice for the files that you receive via Tranz. Tranz support WIFI,so if you have a WIFI phone,TRANZ can be used for a better speed. So what are you waiting for download the application and have fun.